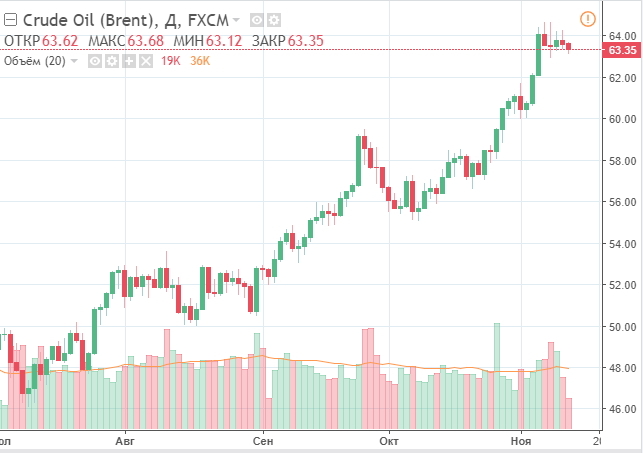 Oil market showed almost no reaction to the annual OPEC oil report released on November 13th, even though the report happened to be fairly optimistic. In particular, while WTI oil futures for December delivery increased in price by as little as 0,11% up to $56,80/b, Brent oil futures for January delivery lost 0.09% and moved down to $63,46/b. Many investors had expected better price dynamics. The OPEC improved several near-term oil forecasts at a time. In particular, the OPEC expects the global demand for crude oil to increase by 74K barrels a day up to 96,94 million b/d, as stated in October’s forecast. In 2018, the daily global demand for crude oil is expected to reach 98,45 million b/d, which is 260K b/d more, FortFS experts report. At the same time, the OPEC report says that the OPEC collectively cut their oil production by 150.9K b/d on average down to 32,589 million b/d in October 2017. This is a 5% bigger increase as compared to the OPEC+ agreement. However, there is a thing that worries international investors. In particular, the Minister of Oil of the United Arab Emirates thinks that the oil rally from $40/b all the way up to $64/b is way too rapid. However, he confirms that the UAE government supports the idea of extending the OPEC+ agreement.